Undetectable infrared marked cards is kind of back marked cards. Only IR3 juice cards camera can read its hidden marks. And zoom lens daylight lamp camera is designed for this undetectable IR marked playing cards. This optical lens daylight lamp camera is used with ultimate marked deck monitor. When you play game with others, then your friend can watch the monitor in another room, and telling you what to do next in the game. It is suitable for many poker games, such as Texas Holdem and Omaha game. Compare with the non-optical lens, this daylight lamp IR marked cards lens rotate for 180 degree and 360 degree. It won't affect the clarity of the monitor image when you adjust it focal length. So, you can place more than 3 poker table in your room. And to some extent, it will cut your costs. And that is to say you will get more. 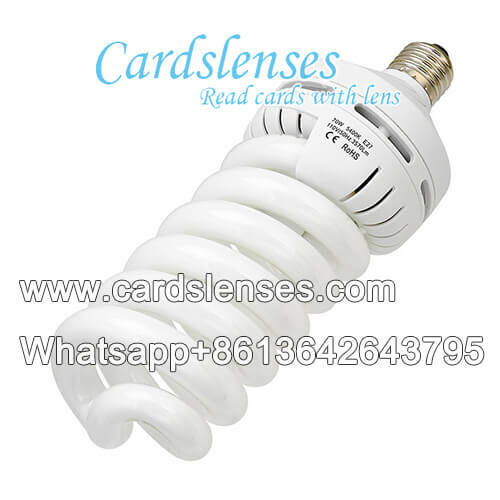 This cards tricks daylight lamp camera has other advantages, for example, you no need put any poker cheating device on the table and you can see both the infrared marked cards and undetectable IR juice cards with it.